ISLAMABAD, Jan 10 (APP): Prime Minister Muhammad Nawaz Sharif Tuesday announced a major Rs.180 billion package of “Export-led growth” to enhance country’s exports over the next five years. He was addressing a function of leading exporters here at the PM Office. The event was also attended by Minister for Finance Ishaq Dar, Minister of Commerce Khurram Dastgir Khan, besides other cabinet members. 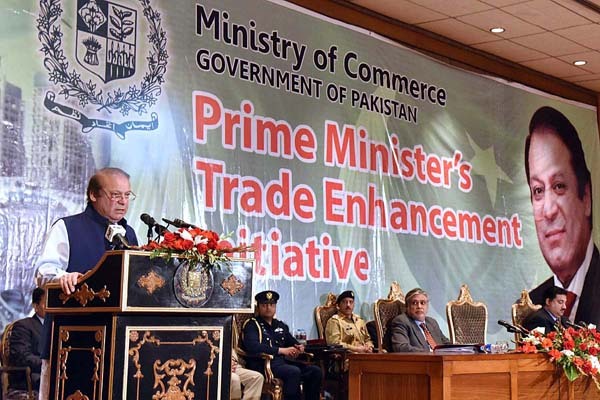 The Prime Minister who earlier had a detailed meeting with representatives of the exporters, said the package would strengthen country’s economy by manifold as country’s exports increase. He said it would also help bring an end to poverty, illiteracy, and backwardness in the country and generate employment opportunities. He regretted the dismal performance of the previous governments that did little practically for the uplift of country’s various sectors, apart from paying mere lip service in the past. Prime Minister Sharif recalled the economic situation in 2013, when the country was on the ebb of default and said with hardwork, dedication and commitment, the country’s economy was now stable and on the rise. He pointed to some sections of the media that on evening talk shows regularly portray a negative picture of the country and create a sense of despondency. The Prime Minister said he believed in freedom of press and healthy and constructive criticism, aimed at removing the shortcomings, however regretted negative propaganda for certain motives. Prime Minister Nawaz Sharif said his government was committed to not only ending the loadshedding, but also lowering tariffs to make it more affordable and the products competitive. He said when his government took over, there were limited funds available, but owing to sincerity of purpose and commitment all hurdles were removed and several mega projects of power generation were in different stages of completion. He said Rs 110 billion have been allocated for acquisition of land for the Bhasha dam that would produce 4500MW cheap electricity. He said performance of Pakistan Railways has improved and its upgradation would not only increase quantum of passengers and goods, but would also cut down the travel time. He said a total of $8 billion were being spent upon upgradation of Pakistan Railways. He said since his government came into power the electricity tariffs have declined by 26 percent. He said 10,000 MW would add to the national grid by 2018, while in next few years power generation would go up to 30,000 MWs. Sharif said fiscal deficit has declined to 4.6 percent and would decline further by next year, while the inflation was down and stock exchange index on a record high. The Prime Minister also mentioned the several road projects that were connecting remote areas of the country with all major trade centers. He said it would cut down travel time and strengthening the national economy. He said Rs 20 billion have been allocated for completion of Lowari tunnel, while several new sections would be added to the country’s motorway network, providing a six-lane North-South connectivity. He said several road projects were now part of the China Pakistan Economic Corridor (CPEC) and would bring prosperity. Finance Minister Ishaq Dar said the government took a number of initiatives for increase of exports and mentioned zero rating of five major export sectors, refund of Sales Tax up till 30 June 2016 were cleared, besides lowering of electricity tariffs and largest ever package for the agriculture sector. He informed that the package covered five value-added sectors including textiles, leather, sports, carpets and surgical goods. Dar said owing to government’s measures leading international financial institutions have noted the remarkable strengthening of Pakistan’s various economic sectors. Minister for Commerce Khurram Dastgir said the government had successfully tackled all the challenges ranging from energy shortage to terrorism. He said the China Pakistan Economic Corridor was now a reality and with completion of various development projects, the country would emerge fully prosperous. Dastgir said the democratic system under the current dispensation also showed resilience. He noted that under the PM’s dynamic leadership, the export sector had witnessed unprecedented surge. President FPCCI Zubair Tufail said Karachi was now a city of peace and life has returned to normal, after years of lawlessness and violence. He lauded the measures taken by the government for the business sector and said this was reflective in reports of international organisations and the stock exchange index. He hoped that owing to the dynamic measures Pakistan’s industrial and business sectors would further flourish and the people would re-elect him in the 2018 general election. Aamir Fayyaz Sheikh chairman APTMA said the package was a welcome change for the textile sector as today the country has achieved economic stability and days of electricity loadshedding were now over. He said prosperous countries achieved success by pursuing a policy of giving priority to exports. He said the entire government machinery under the dynamic leadership of Prime Minister Nawaz Sharif has come up with a package in consultation with the exporters and vowed to double the exports of textile sector to US 24 billion dollars in next five years.